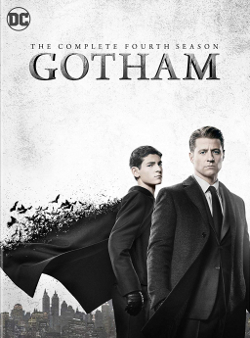 As I remember the fourth season of the Batman prequel Gotham, my one dominant memory is not a good one despite my genuine fondness for the show. It is the violence, an issue that I have written about many times. It's hard to know what exactly has been the nadir of this graphic violence. This season we've seen beheadings, mass executions, people literally blown up and set on fire, numerous people shot in the head, stabbed in the hand (and I think the eye too), had their hands smashed with hammers, torture and even some cannibalism. I also saw that children, or at least young adults, were not spared this gruesomeness. You had a teenager's throat slashed, and there is something about seeing kids killed, or at least the idea of it, that greatly troubles me. It's fair to ask, 'why doesn't the killing of adults bother you then?' Up to a point it does, if it is shown to a level that is much more graphic than I think necessary. I understand a crime show, particularly one that deals with rather dark material will be at times hard to brutal. However, it is not the violence itself that bothers me so much as the graphic nature of it. I think it also has to do with the idea that adults, for the most part, are responsible for their own actions. I'm not talking about people caught in the crossfire. If people like The Penguin or Riddler or even Sofia Falcone get shot, tortured or dismembered, it is the result of their own actions. Even then, however, I don't think we need to see it to the detailed level that Gotham at times indulges in. However, the idea that kids are killed, even in fiction, for entertainment simply does not sit well with me. It never has. There is something to my mind sadistic and cruel about such things. I feel a strong negative reaction. It is bad enough when I see adults having their heads blown up. The idea of kids getting their throat slashed and being murdered, even if it furthers the plot, just makes me recoil. Gotham has never shied away from being very violent. I just at times watch in horror and sadness that it feels the need to show so much detail in these acts when they could pull back. This issue about the graphic violence, not the violence per se, is what has always kept my enjoyment of Gotham from being total. I can find some good things in Gotham Season Four. We've seen some really strong acting from both regular and guest cast. David Mazouz has done what perhaps should have been done from the get-go: become more dominant as Bruce Wayne. His evolution from the frightened child down to the growing young man eventually coming to embrace his fate has been a fascinating thing to watch; even his brief turn as a 'bad boy' was effective albeit curious. We saw Bruce in bed with pretty young things, but how can you assume Bruce Wayne had a lost weekend when everyone wakes up fully clothed? Mazouz was also matched by Camren Bicondova as Selina Kyle. Their work together is excellent, this duo of the future Batman and the (potentially) future Catwoman beginning their curious cat-and-bat game. On her own, Bicondova has excelled, making Selina less a true villain and more an anti-heroine, one who has a conscience and struggles between her own desires for wealth and power and her basic goodness. The push-pull between Wayne and Kyle is a highlight of Gotham. Also included in the performances is Robin Lord Taylor, who to my mind is a definitive Penguin. Gone is the crazed Danny DeVito version and the campy Burgess Meredith version. Taylor's Penguin is an evil man: generally heartless, ruthless, vindictive, and totally about self-preservation. Even within all that though, Taylor can make Pengy almost sympathetic, even comical. When he rages however, despite his small frame, he is frightening. A couple of guest characters have always been highlights for me too. One is Anthony Carrigan's Victor Zsasz, who brings a wry almost innocent humor to his interpretation of the master assassin. Usually teamed up with Taylor's Penguin, Carrigan is able to make Zsasz menacing but also oddly endearing. His form of comedy is never forced or jarring, and he brought a lightness that was most welcome. I also thought well of Nathan Darrow's Mr. Freeze to where I would have liked him to have done more. One can't have everything, I guess. I give credit to Cameron Monaghan as the (maybe) Joker, especially since he played multiple characters. Granted, the twin business was not to my liking and this fan-dance of whether he was or was not The Joker was grating, but I can't fault Monaghan for that. Perhaps he won't be the definitive Riddler (I think Frank Gorshin will take that post), but Cory Michael Smith too had to play two parts: Edward Nygma and The Riddler, and he kept it believable. As I look back at Gotham Season Four, again I return to the issue of the graphic violence on the show, not so much the violence itself. Perhaps if the focus had been more on Bruce Wayne than Jim Gordon things might have turned out better. On the whole though, while not terrible I am hard-pressed to think I was wowed by this series.